I think many Rock fans were surprised when Frontiers Records announced a new project, called MOONLAND featuring Lenna Kuurmaa. That girl from the Estonian girl-group Vanilla Ninja? It may sound strange to some Rockers, but if you take a closer look at Vanilla Ninja's music Frontiers decision is not far-fetched. The band was always a very melodic mixture between Pop and Rock and so an AOR record fits Lenna very well. People outside of Europe may not know this charismatic woman. To those of you I just can say: listen and enjoy her beautiful voice without any prejudices. To introduce Lenna to the Melodic Rock / AOR community I did an interview with her. Check out what she had to say about the Moonland record, her carreer in Estonia and of course about Vanilla Ninja! Hello Lenna, it’s a pleasure to talk to you! How are you? Lenna: Thank you, I am doing good. 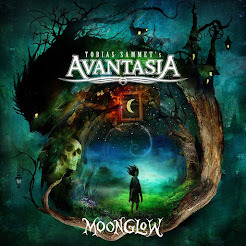 The debut album of the new AOR project “Moonland” will hit the stores this month. How did you get involved? What convinced you to be part of this project? Lenna: It was a big surprise for me when Frontiers Records approached me with this idea to make an AOR album together. I did not know at first where this Italian label found me (laughs) but later on it came out that they remembered me from Vanilla Ninja times. As I am a musician working mainly in my homeland Estonia then this international project sounded interesting to me. I took it as a challenge. It is also interesting to try new things and do different kind of music for a change. My band "Lenna"sounds more like indie-rock so Moonland is a challenge in many ways. As you might know there are various AOR projects out there, so what is so special about Moonland? Lenna: I guess the listeners will find it either special or not. I can only say what I think- Moonland has powerful and hooky melodies. I think it is very well produced and sounds fresh. Who was part of the songwriting process? Lenna: Not me (laughs) I got to know Alessandro (Del Vecchio) who also wrote many songs and produced the whole album. Can you tell us something about the recording process? Was something different than on records you’ve done before? Lenna: It was very intense, cause we recorded the vocals for the whole album in 10 days. When I do my records with my band "Lenna" then the process is different.We write songs together and record and experiment a lot. I would say the process takes 1,5 to 2 years until one records is complete. Moonland is a different kind of project. For me it was a vocal-studio-performance. Is Moonland supposed to be a studio project or is there a chance to see you live again? Lenna: I would love to play live, we had much fun at the Frontiers Festival in Milano this year. I think live is live - its why we do what we do. I do hope we can play with Moonland again! Are there any other projects in the nearer future? How familiar are you with the Melodic Rock / AOR genre? Any favorite bands? Lenna: I am not very familiar. I would say I listen more to old stuff. I like old sounds from the 60's. When I am not working and I am at home - I don't like to listen to music at all. I enjoy the silence. After the break with Vanilla Ninja it was a bit quiet for a long time and we didn’t get to hear anything from you (at least outside of Estonia). So what have you done in the last seven years? Why is this the right time for an international comeback? I already mentioned Vanilla Ninja and to be honest people expect me to talk about this band, so I hope it’s OK to ask you a few questions. First of all: you had huge success here in Europe and I’d like to know what is left from this time in your memories? Lenna: It was a super crazy time in my life, we were 16 years old when we started with Vanilla Ninja. So you can imagine how different I look at things now (laughs). But I must say it is a time I never want to forget.Vanilla Ninja made me who I am today. It also gave me much belief that everything is possible - when you really want! That is so true! Vanilla Ninja was the best thing that could happened to us. At the moment I see that it is good it also ended ... everything has a reason and has its time.Vanilla Ninjas time was over and it opened new doors. There were lots of line-up changes back then. Why was that? Lenna: Line-up changes were necessary, cause one girl got pregnant and wanted to create a family just when we started. And the other line-up change was because of musical differences. Did you feel much under pressure when you started your solo career? Lenna: Kind of, but at the same time I tried not to let it effect me. Could you imagine bringing back Vanilla Ninja (maybe with a more mature sound) or is this chapter closed for you? I know that some people said you were just a girl-group but to me you had also lots of elements of this female 80’s rock bands in your sound. Who inspired you back then? Lenna: Everyone, who we listened to inspired us from Pop to Rock. Which song are you most proud of (in your whole career)? Lenna: I think the ones I have written with "Lenna". Many people say the show business changes people, is that really true? I mean you experienced a lot in the last 10 years. Did you change? Lenna: I am sure it has left an effect on me and I think a good one (laughs). Which advice can you give all those newcomers out there? Lenna: You have to believe in what you do - and it will work. There is a right time for everything. Let’s talk about more private stuff: what do you do in your free time? Lenna: I spend it with my dear family and friends. What do you love about Estonia so much? Lenna: That Estonia is so small and sweet. We have so much fresh air and beautiful, beautiful nature. All the seasons are beautiful. Lenna, thank you for your time. Do you have a message to your fans out there? Lenna: Keep listening to good music!